The apartment Arenas del Mar is an ideal place for surfers and people who love the hustle and bustle El Médanos. 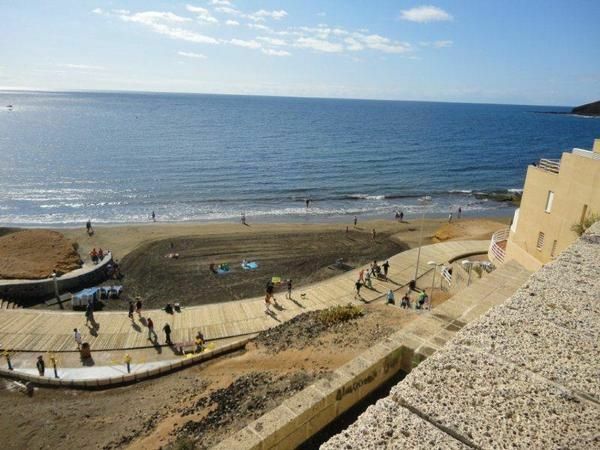 It is centrally located just a few meters from the Plaza and the stunningly beautiful sandy beach, where both sun-worshipers, as well as surfers get their money. The modern apartment has 3 bedrooms, a bathroom with shower and a kitchen that is fully equipped with oven, electric cooker with ceramic hob, fridge and freezer, toaster, dishwasher, coffee maker and microwave. The living room has a white leather sofa and a flat screen television with satellite programs. There is an open passage to the balcony with natural stones on the wall, which makes for a pleasant ambience. The balcony is glazed all around, so that you can open the sliding elements as needed. Internet is available via Wi-Fi free of charge. The first bedroom has a double bed (2,00 x 2,00 m), the second bedroom has a double bed (2,00 x 1,60 m), the third bedroom has a single bed (2,00 x 0,90 m). A washing machine and ironing facilities are also available for free. Final cleaning: once per object Costs amounting to 125 EUR (Mandatory).